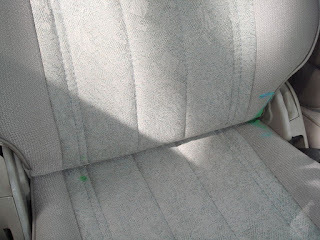 Danielle asked: Does anyone know how to get melted crayon off a car seat? We left one in the car. And it got close to 100 degrees today! All that was left was the wrapper. What is even worse is that it was my son's Blues Clues crayon! Mona replied: Try using an iron (steam setting) with newspaper to blot the wax. I did this when I spilled candle wax on my carpet, and it worked fine. Carla added: Actually, it is better to use a brown paper sack or plain newsprint with no ink, or the ink may transfer and stain also. Thanks to Danielle, Carla, and Mona for this Frugal Baby Tip!